Today my boss asked me to go take the company car to get an oil change at the dealership. Got to the dealership signed the car in and then I had an hour and a half of free time. What better to do than to car shop? My grandparents want a new car and they like my opinion, so why not explore some options? First dealership I was at was the Chevy dealership. First thing that happened when I walked in The door was I was greeted by a nice salesman in his 20s and given the basic "if you have any questions, just ask." So I looked around for a bit. 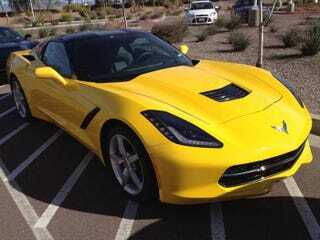 I was examining the yellow C7 they had in stock when another sales lady walked up. She said "looks like you just want to drive away in it!" We talked for a bit, I mentioned my T/A and she offered that I could drive any car in the place that wasn't a corvette and that I should bring the T/A around one day the next time I go shopping. She was a really great salesperson, answered all my questions without hesitation, listened to my story, and really didn't mention sales at all. I was really surprised that she took the time to have a lengthy conversation with an 18 year old. I mean, I was well dressed and looked confident, but still, I wasn't expecting even any recognition by the staff because I was so young. I would buy a car from her. I wanted to drive a manual Sonic RS but they didn't have one in stock. The second dealership I went to was the Mopar dealership. The sales people greeted me but were really giving off the "you're young so I don't want to offer you any help and don't waste my time" vibe. I even got an angry glare when I asked if they could unlock a newer charger. I would not buy from them or recommend my grandparents to buy from them at all. The third dealership I went to was the local BMW dealership. None of the staff bugged me while I was walking around the lot (no staff were outside either), but also none of them greeted me when I went inside either. At that point I figured a dealership selling cars at a higher price point wouldn't even bother with a kid like me. Luckily I was wrong because as soon as I asked for help a delightful man who knew a ton about the current BMW product line came to my aid. My grandparents want to upgrade from their 3 series to a 5 series so I asked a ton of questions regarding that. The man was not afraid to mention the cars faults or BMWs stupid naming scheme and even suggested I look at the 4 series as it was a cheaper alternative. So really what I learned today was many dealerships are starting to realize the younger generation has purchasing power. Even though we may not buy today or in a few months, a good impression made on a young shopper by a dealership is very valuable in the long run. The other lesson? $35 oil changes at the dealership are way overpriced! Stick to doing the work in your driveway ladies and gentlemen. What's your "going to the dealership as a young person" story?